Chip Campbell, a mesh of man and machine, and an engineer for Cybernetic, Inc. in 3660 A.D., constructs a time machine, dubbed Timetracker. With the help of his super-computer, Roberta, and the oversight of the Time Marshalls, he makes jumps to London, England - Jack the Ripper era, Nazi Germany and several other places to correct errors in the timeline. However, not all is as it seems. 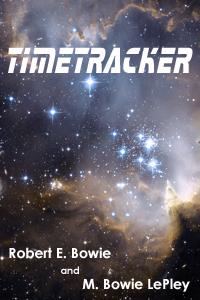 Someone else has a control module to Timetracker, and Chip must figure out who it is before the timeline disruptions irrevocably alter the course of history. This was a book my late father wrote many years ago. The one and only book he wrote. He had told me after he wrote it that he'd never write another one, that there were a lot of things he did in life, but most of them only once. Baking a cake was another one of those things. I wish I could remember more, but unfortunately I can't. My dad passed away in 2015 and I keep this book on my website because it's a small way I can make sure he lives on. I sure do miss him.